Celtuce makes an unusual addition to the salad bowl. 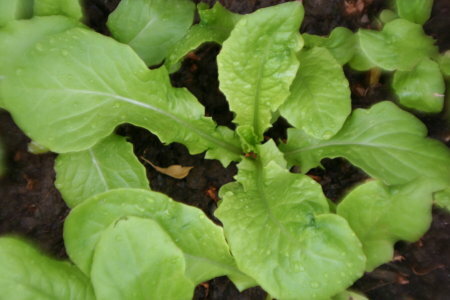 Celtuce, or stem lettuce, is an Asiatic plant grown for its succulent stem, which can be sliced and cooked or used raw in salads like radish or cucumber. Stem lettuce requires fertile soil and plenty of moisture, especially in the early leafy stage, to grow well. Sow seeds in spring, either in situ or in trays or modules for transplanting. Seedlings should be transplanted no larger than the 3 or 4 leaf stage. Like ordinary lettuces, celtuce is subject to high temperature dormancy. Space plants 30-35cm (12-14") apart. Mulch after planting to conserve moisture. The stem is generally ready for harvesting about 4 months after sowing, when about 30cm (12") tall and at least 2.5cm (1") in diameter. It can be left until just before the plant starts to bolt without becoming bitter. Strip off leaves and if the outer skin is tough, peel it off before use.